Santos Fito Burgos Amador, at 60 years old, was forced to undergo the humiliation of being seen rolled along the public streets of La Ceiba, half clothed, in order to receive a chest x-ray. Sunday, Mr. Burgos Amador of El Porvenir in Atlántida, fell from a bridge while fishing for food for his family. He suffered a chest injury, and was brought to the Honduran Institute of Social Security (IHSS) clinic in La Ceiba for treatment. Apparently, there was no staff available to perform an x-ray, so he was referred and admitted to the Regional Hospital of Atlántida. The Atlántida hospital, however, also did not have this service available, nor an ambulance to transport the patient to a private facility that could perform the x-ray. The family, with no resources to pay for a private ambulance, and with their elderly family member in urgent need, were compelled to get him to the necessary location by whatever means possible. 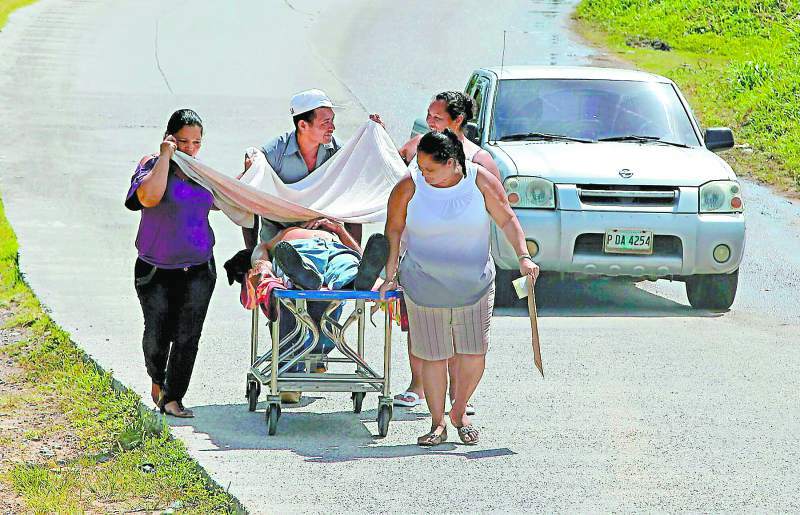 Grabbing a hold of the gurney where Mr. Burgos Amador lay, the family pushed him, for about ten minutes, along a bumpy public thoroughfare to the private medical center.